Good morning! I'm skipping the Neverending Pile Challenge for today because I don't have any untrieds that fit the theme. 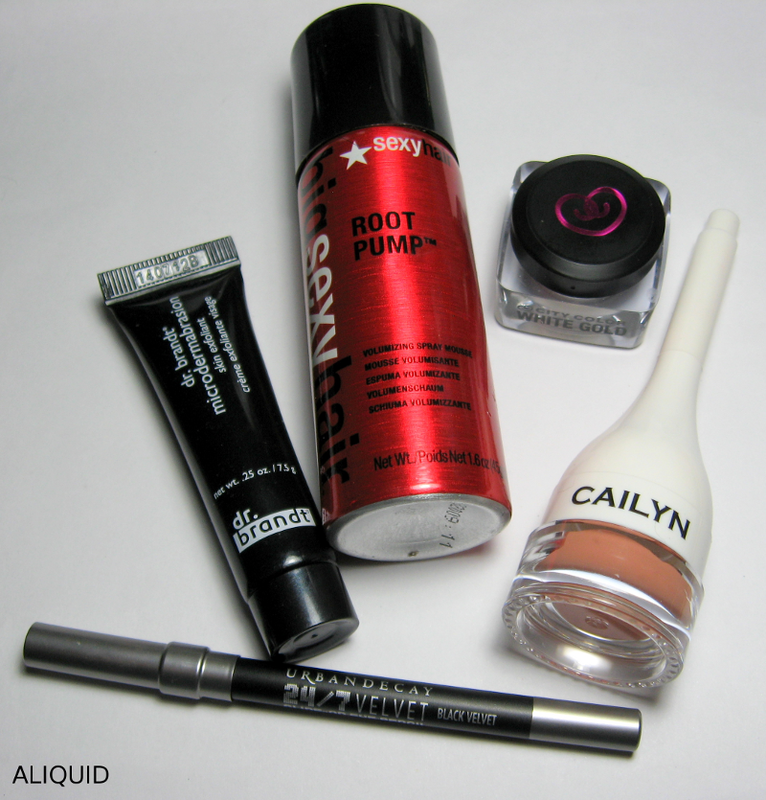 Instead, I'm going to show you what I got in my Ipsy Glam Bag this month! If you haven't heard of Ipsy, it's a $10-per-month beauty and skincare subscription service. Each month you get 4-5 full size or sample size products. You can review each product to help Ipsy customize your next bag. 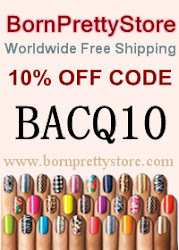 You also get exclusive deals from all the featured brands each month. Here's my referral link if you're interested! Nailtini Bloody Mary. Two coats with Out the Door topcoat. Yay, nail polish! I've known about Nailtini for a while but never actually owned any until now. Bloody Mary is a vibrant scarlet that I would call a crelly or very thin creme (you can still see my nail line a little after two coats). It's a bit darker in real life than it appears in my photo. The formula was thin but not too runny. The brush was a little wide for my tastes--I think if you're going to go with a wide brush, you should pair it with a thicker formula that stays in place on the nail, or people will make a mess of their cuticles (as I did). On the whole I would try Nailtini again, although with a more exciting color than red! Since we're rapidly approaching summer (although it still feels like April here today), I was glad to try some new sunscreen. 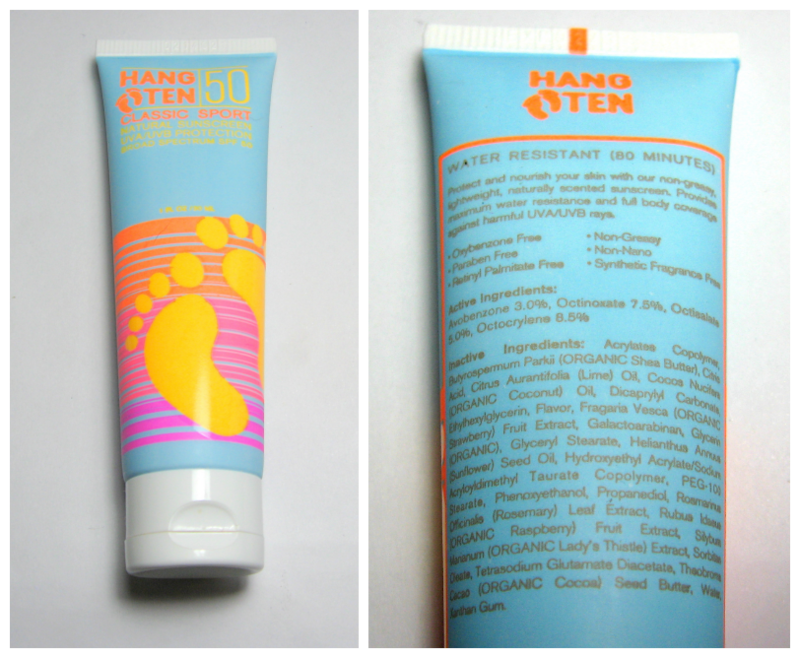 This stuff is a more natural take on sunscreen and has lots of organic ingredients. I especially like the fact that it uses only natural extracts for fragrance; it has a nice subtle tropical scent that's a far cry from the usual overwhelming fake coconut smell of most sunscreens. And it was definitely less greasy than your average sunscreen. I tried it on my arms and could barely tell I was wearing anything. Good stuff! I have been on an eyeshadow kick lately, especially for warm neutrals, so I was excited to get this duo. (Note: I'm not actually sure which shade is Celestial and which is Opal, so let's just assume the pink one is Opal, OK?) They're "coconut-infused", whatever that means (there's no coconut in the ingredients list, so I'm assuming it's some coconut derivative). Sadly the color payoff on these shadows was not great, as you can see from my swatches. Opal is a peachy pink shimmer which you can just barely see on my arm, even though I slathered it on. Celestial is a light warm brown with metallic gold highlights. I had a lot of fallout on my cheeks from this one. Here's a crappy picture of me wearing these shadows over primer. I used Opal on my inner eye and browbone, and Celestial on the middle of the lid--on the eye the brown kind of disappears and you only see the gold, so I used an additional brown shadow on the outside corner to round everything out. So these eyeshadows were not too exciting, but I will probably still keep them around for subtle looks. I love trying out new moisturizer! Even though this is for "normal-dry" skin and I'm on the oily side, my skin tends to be dehydrated due to my acne treatments, so I love super hydrating stuff. 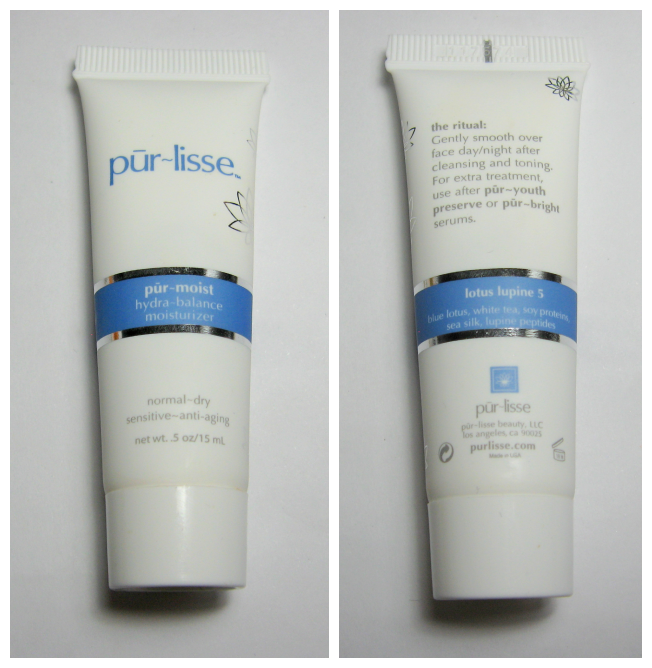 This moisturizer has a gel-cream consistency, spreads on very nicely and feels great. It doesn't sink in completely on me, but I wouldn't say it feels too greasy. The scent is very light and reminds me of my grandma for some reason! I should note that despite the natural additives it boasts (if you can't read my bad picture, it's got "blue lotus, white tea, soy proteins, sea silk, lupine peptides"), this isn't an all-natural moisturizer. But it does avoid a lot of unpopular ingredients like parabens, petrochemicals, and artificial colors/fragrances. Those natural additives are supposed to do all sorts of good things for your skin long-term, which obviously I can't comment on. The full-size product is a whopping $55 for 1.7 ounces, so even though I like this moisturizer, I won't be buying it anytime soon. OK, time for the most bizarre product I've ever gotten in a subscription box. Kindly direct your attention to the ingredients list...yes, this is a spray-can of water. An 18-dollar spray-can of water. It is supposed to sooth irritation after cleansing, skin treatments, sunburns, etc. and otherwise be all-around good for your skin. I read through their entire brochure attempting to find out what made this water different from...y'know, regular water (special minerals from the spring? ), but somehow they managed to completely avoid saying anything concrete about how this is supposed to work. 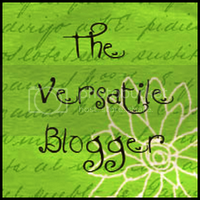 I dutifully tried this product anyway (several times! ), for the sake of my gentle readers. 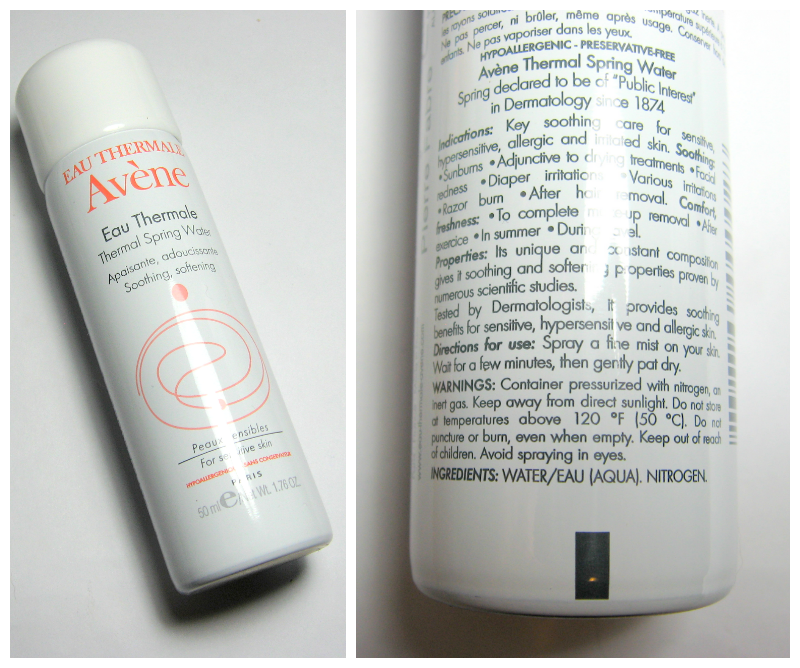 I sprayed it on my face after cleansing, let it sit for a minute, then patted dry as directed. Of course, it felt nice and cooling on my face, but so would tap water. I don't have sensitive skin, so maybe I'm not the target audience for this stuff, but I didn't notice any actual effects on my skin. I was surprised to read so many positive reviews on Amazon, and I wonder if there really is something to it or if it's just the placebo effect (I mean, it's French, so it must work, right?). OK, so aside from the overpriced water, I was satisfied with this Ipsy bag. Don't forget you can use my referral link to sign up if you're interested! Good morning! 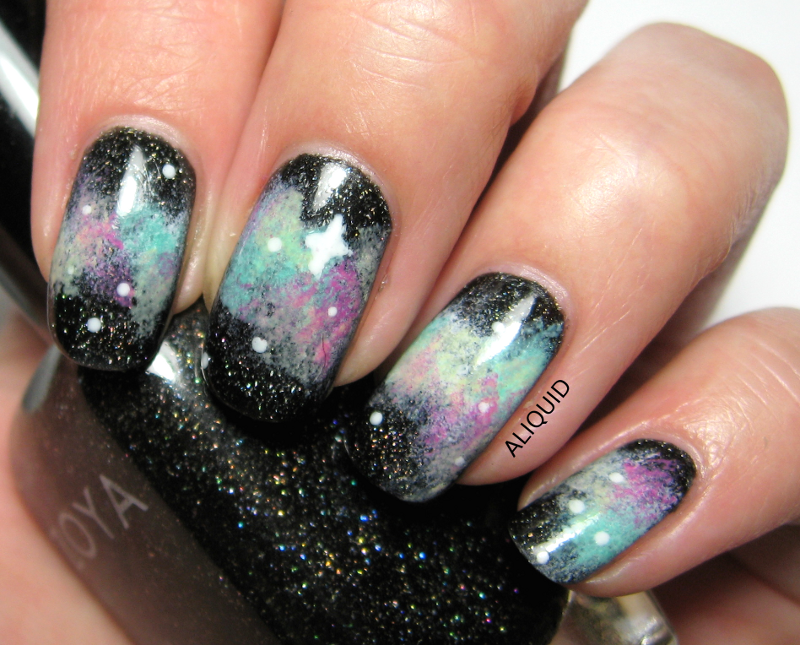 For this week's FingerFood's Theme Buffet we're doing galaxies. I think this is my third attempt at a galaxy mani. My previous efforts were mediocre; I think this one is the best I've managed so far. I'm actually most proud of the fact that my star placement is pretty random--I really have to struggle not to make everything symmetric! 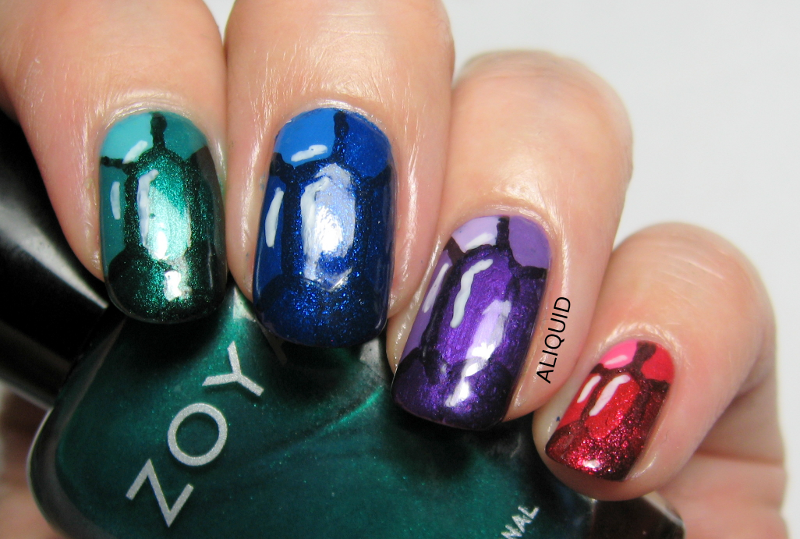 I used Zoya Storm for the base (because really, how could I not?) and Maybelline Porcelain Party, Color Club Age of Aquarius, Julep Bea and Revlon Passionate Pink for the rest. This mani reminds me--have you been watching Cosmos? I think it's great to have some real science on TV again, since all the "educational" channels have switched to reality shows now. I think the show does a great job communicating the mindblowing-ness of nature! If you like it, you should definitely read some of Carl Sagan's books--he was an all-around amazing human being. I won the product in this post in a giveaway. All opinions are my own. Good morning everyone! 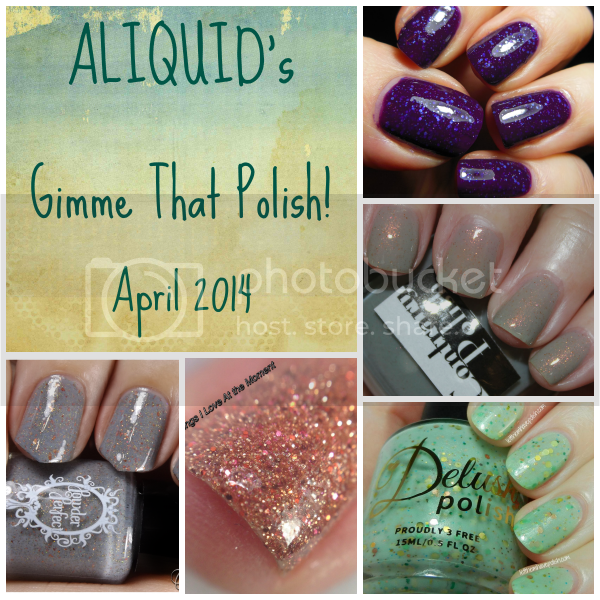 Today's Neverending Pile Challenge theme is giveaway/blog sale polish. I've only won a couple giveaways (but I keep on trying! 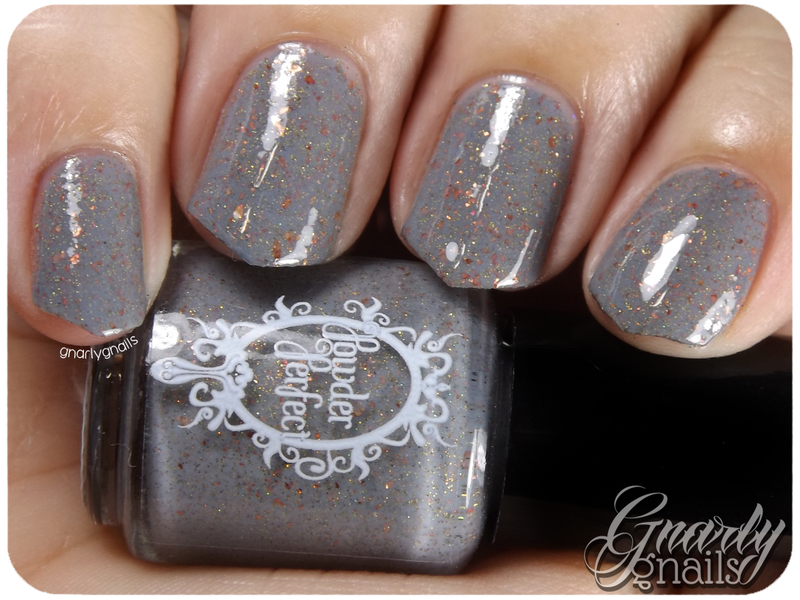 ), but here's one I won but haven't worn yet: Spell Polish Troll. 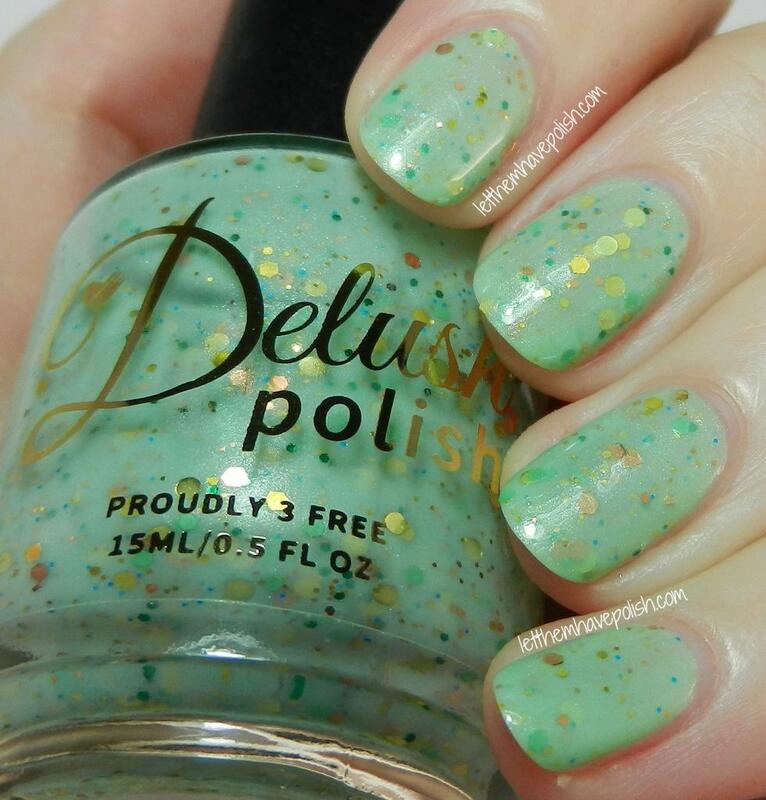 Troll is a clear base with lots of teal/green/gold shimmer that shifts in the light (almost a frost/metallic finish), plus a smattering of holo glitter. Spell Polish Troll. Two coats with Out the Door topcoat. 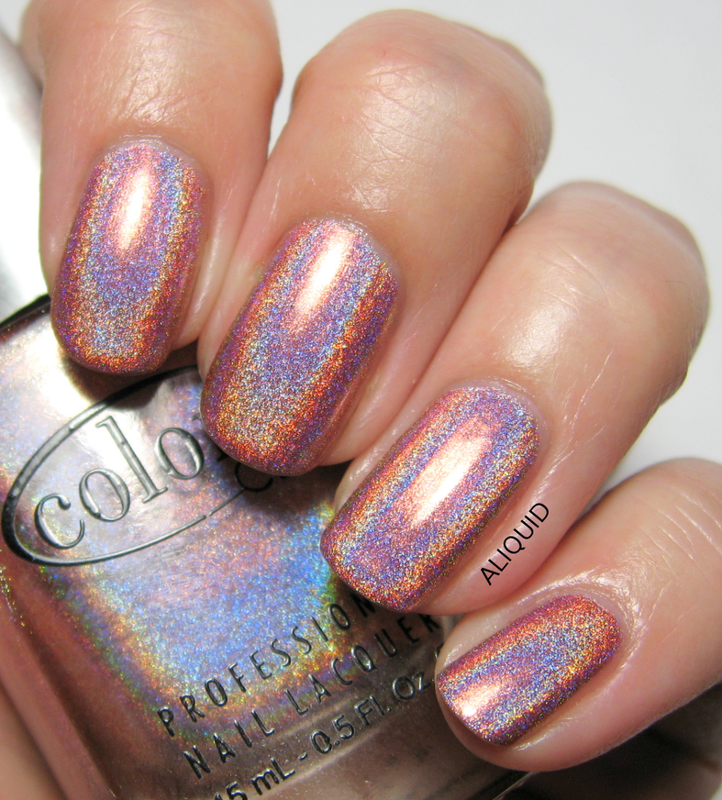 Very pretty and ethereal--magical even (hey, it's Spell Polish after all)! This is supposed to look good over black too. Since there's no base color backing up the shimmer, it's a fairly sheer polish. Application was fine. I did have a couple problems with the formula though. First of all, it was very slow drying. By that I mean it took forever to reach the point of "tacky but non-liquid" that most polishes hit pretty quickly; while I was cleaning up my cuticles I kept accidentally making the polish slide around on my nails. Once I got my topcoat on, it seemed to dry normally. The second issue I had was the smell: this polish has a very strong, unusual smell (not due to any of the "big 5" chemicals, just a characteristic of the particular suspension base used). It was so strong I had to breathe through my mouth while I was applying the polish. For someone who plays with nail polish all day, that's saying a lot! The smell kind of hangs around until the polish is dry. If you are very sensitive to smells you might have a problem with this brand. On the bright side, the bottle is beautiful, and I got a free sticker along with the polish. 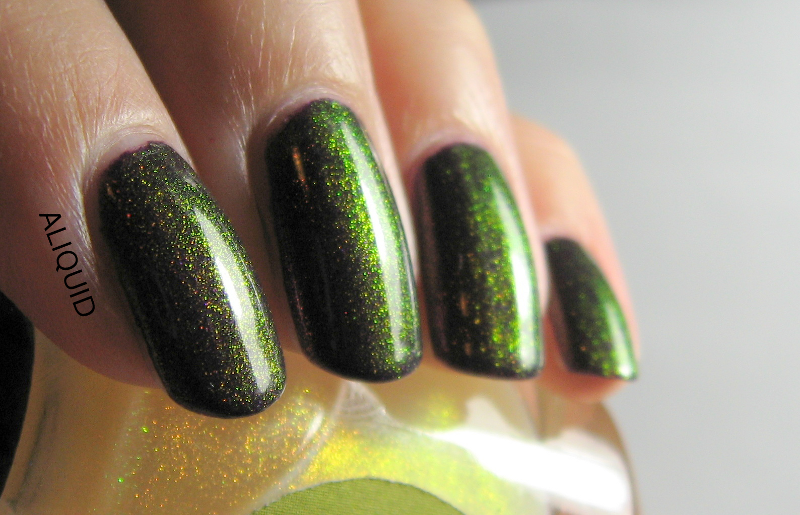 Troll is available at Spell Polish's shop ($17 for 15 ml). Anyway, today's Neverending Pile Challenge prompt is glow-in-the-dark. 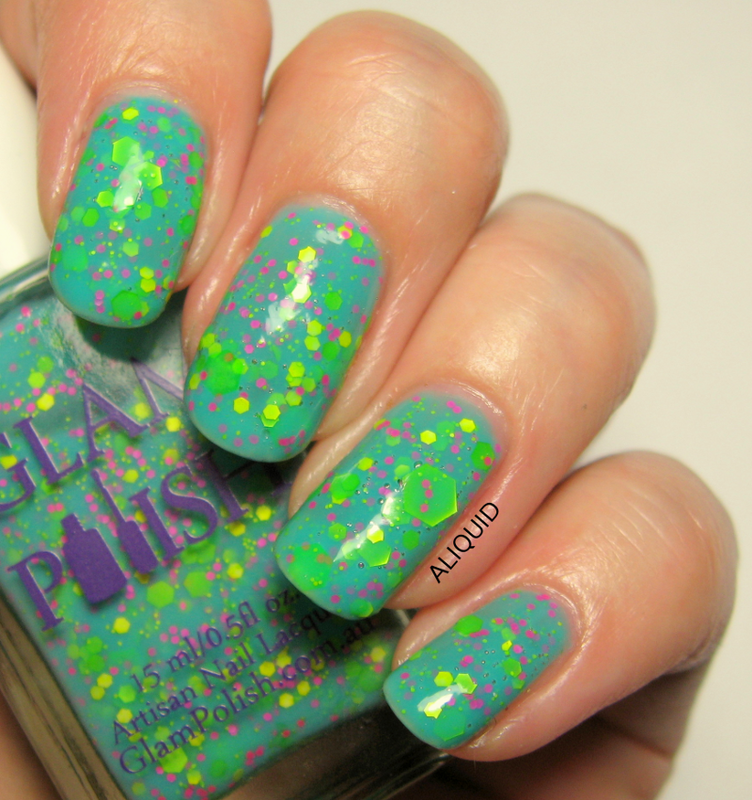 As far as I know, I only have one glow-in-the-dark polish, and luckily it's an untried! 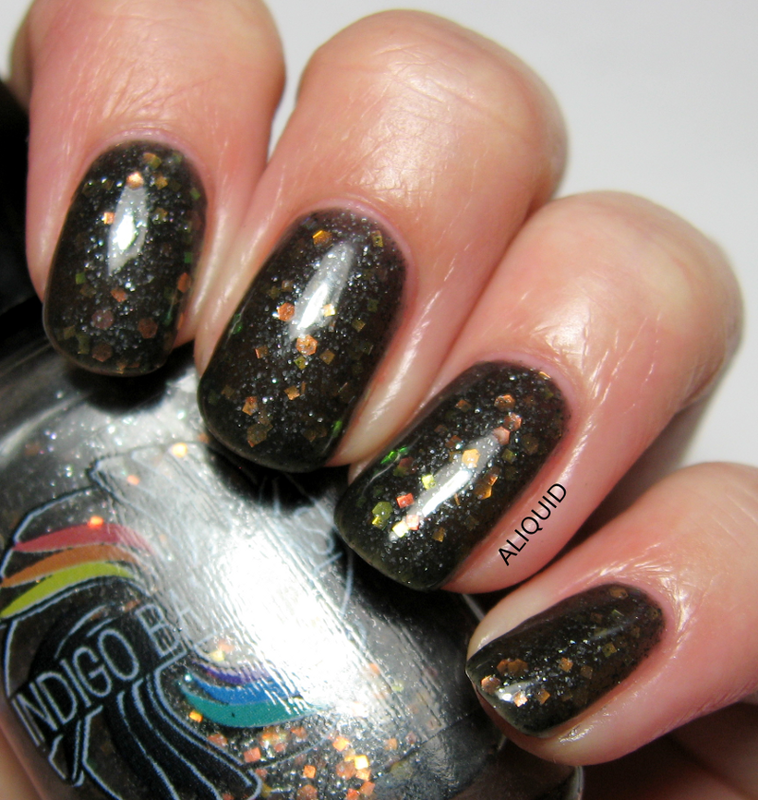 Indigo Bananas Medusa Transducer is a very sheer charcoal grey jelly with orange-green iridescent glitter and little silvery flecks. Plus it glows teal in the dark! Indigo Bananas Medusa Transducer. Four coats with Out the Door topcoat. This is a super spooooky polish! I'll need to wear it again in October! It is very very sheer--I needed four coats to get it opaque--so next time I'll definitely layer it over something else. 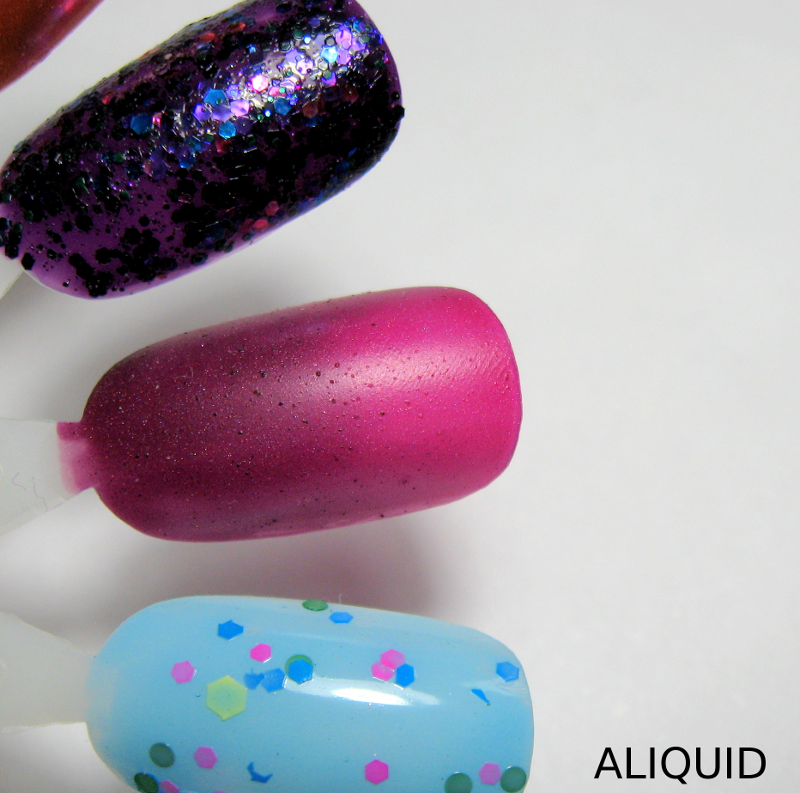 The formula was excellent as per usual with Indigo Bananas, although I would have liked more glitter payoff per coat. I don't think it took too long to dry. 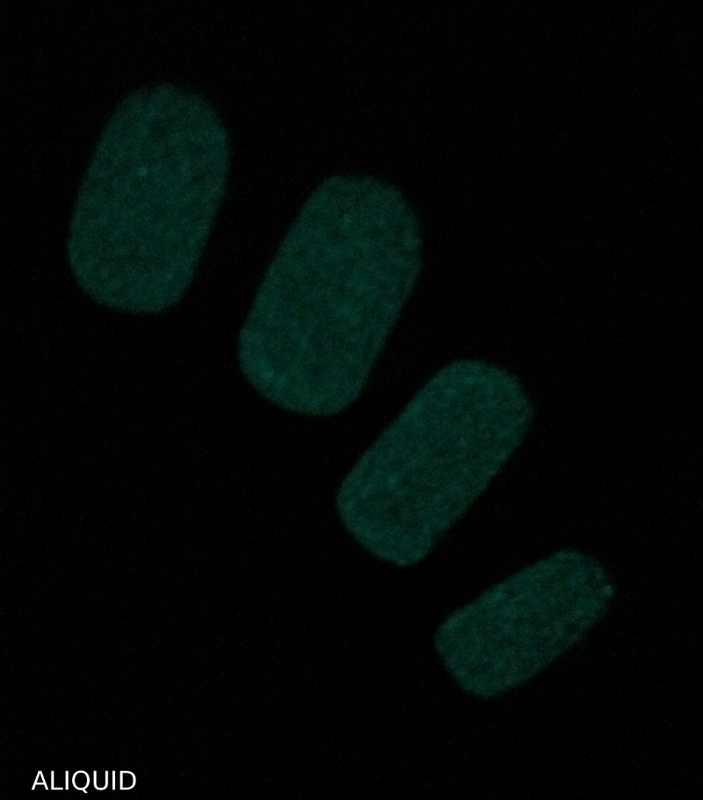 Here's the teal glow! I charged my nails under my lamp for a while and then in the sun for just a few minutes, and the sun definitely charged them more quickly. Anyway, this week's FingerFood's Theme Buffet prompt is Oriental. I have always been in love with Thai art and architecture, since it seems to be such an interesting mix of South and East Asian influences. 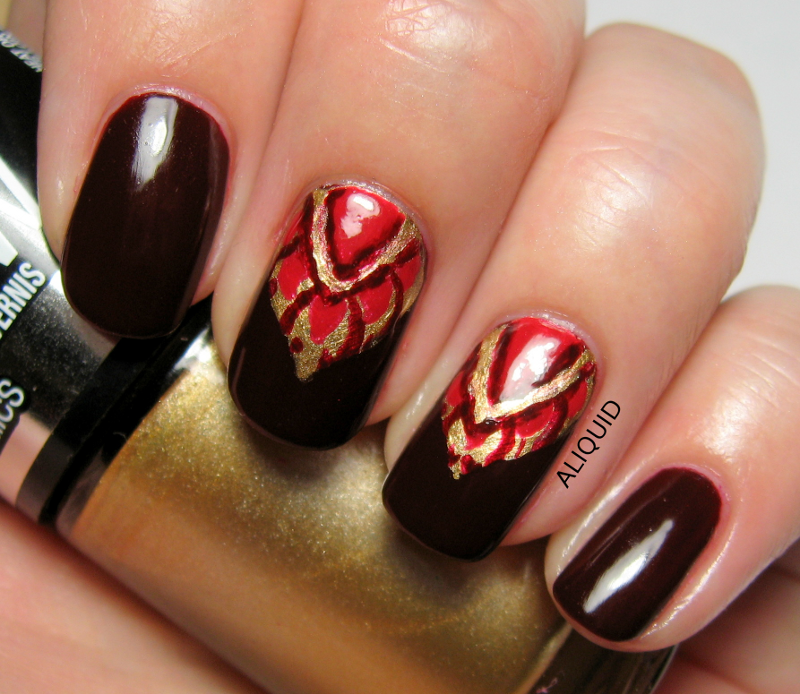 So I Googled for some Thai art motifs and picked a (simplified) one to do on my nails. I still need more practice freehanding (and maybe an even tinier brush!) but I had a lot of fun doing this mani! I used Deborah Lippmann Just Walk Away Renee, Maybelline Bold Gold and Revlon Red Carpet. This month's bag was a little disappointing for me. There were a couple products I won't use, plus there were a few others in the monthly collection that I really wanted but didn't get (including nail polish!). I'm hoping that my reviews of this month's bag will help me get better stuff next time! This is a good physical exfoliator, although I have to say it's the most painful one I've tried. It does get the job done though, and my face felt really smooth after use. It smells kind of like lemon drop candies. Given how expensive the full size tube is, I think I'll just use up this sample and then go back to my old exfoliator (Dermadoctor Physical Chemistry, which is both a physical and chemical exfoliator!). It took me a little while to figure out what was going on with this funky container, but then I realized that there's a brush in the cap! Unfortunately the brush is so tiny that it takes forever to get my lips covered evenly. This lip balm definitely doesn't feel very balm-y; it's pretty dry and matte. 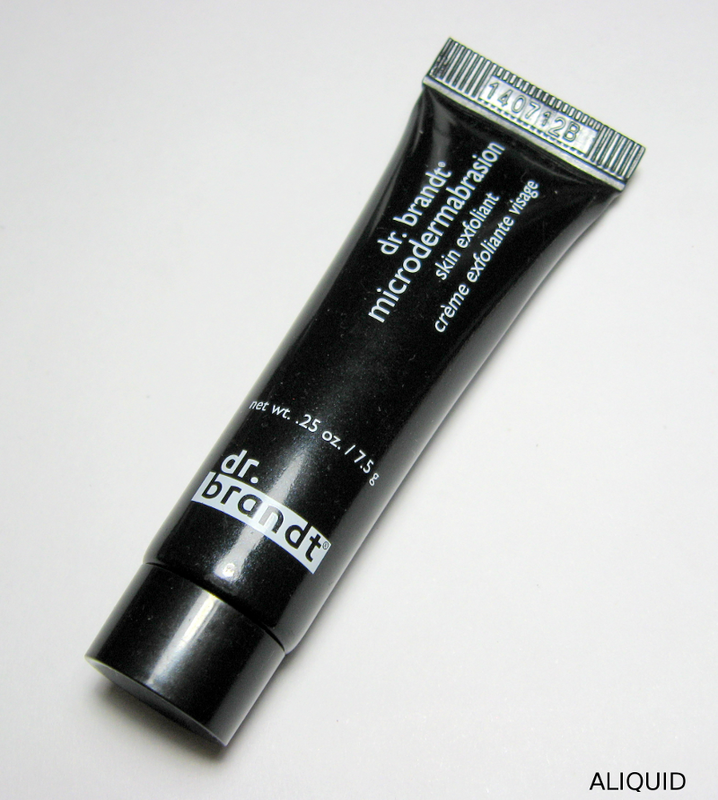 It contains only synthetic moisturizers, no oils or butters that we might look for in a lip balm. It does have nice pigmentation and seems to be fairly durable. This one gets a "meh" from me. I let out a sigh when I saw this stuff in my bag. My hair is ultra ultra fine ("like baby's hair", a hairdresser once told me) and basically every leave-in product just weighs it down and makes it grimy. But for the sake of my gentle readers I tried this mousse anyway. 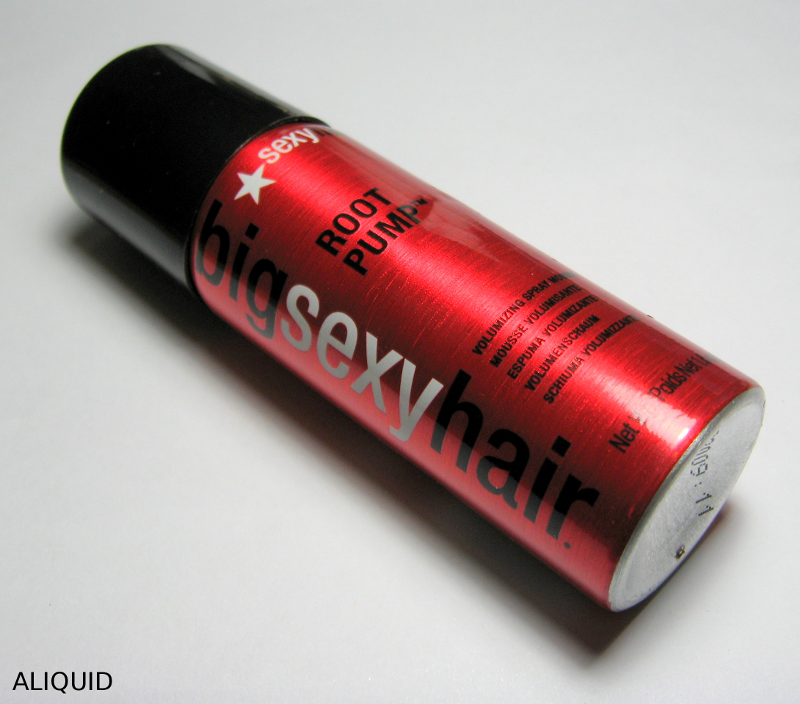 You're supposed to work it into your roots and a few inches down from the roots when your hair is damp, then blow-dry. My first hint that things were not going well was that I had a hard time brushing my hair as I blow-dried it. Sure enough, my roots were sticky and had a visible residue. I did notice a slight increase in volume below the roots (where I put less of the product), but the volume was mainly horizontal and not vertical. My roots themselves remained flat. Oh well! 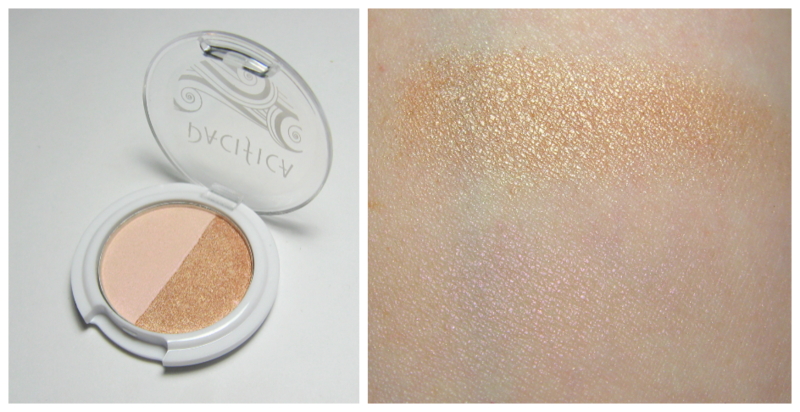 This eyeshadow mousse is a bright, sparkly light gold. It has really nice pigmentation--probably a little too bright for my taste actually. Unfortunately I found it to be a bit sticky and hard to spread, so it wasn't easy to get it diffuse enough for a more casual everyday look. 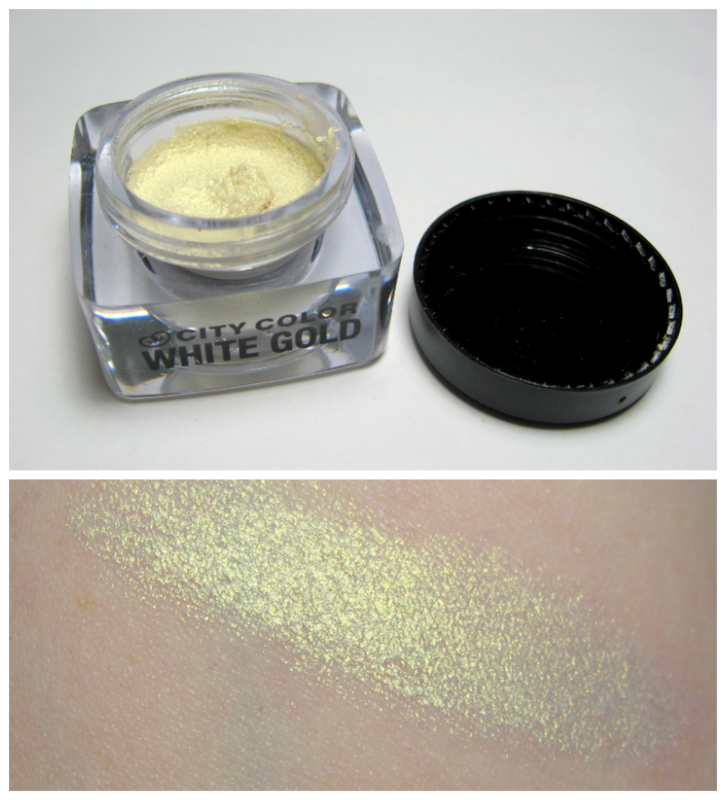 I'm not sure if you could really use this as a highlighter in areas besides the eye because of how pigmented it is. If only I used eyeliner, this would be the star of my bag! Unfortunately, as I've said before, I'm hopeless with eyeliner because I flinch so much. But I might keep trying with this pencil! 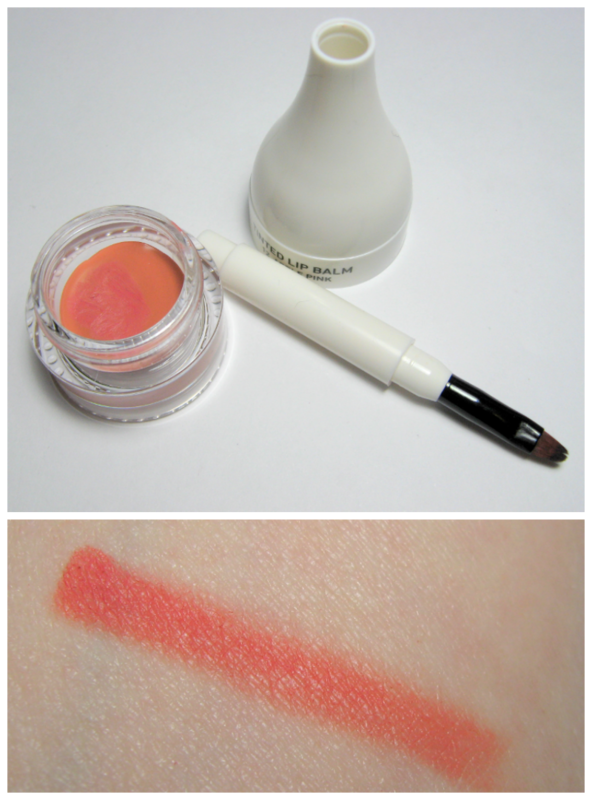 It has a really soft, almost liquid-feeling application, and the color payoff was very nice. As you can see, it doesn't make an ultra-sharp line, as it's intended especially for blended-out looks. 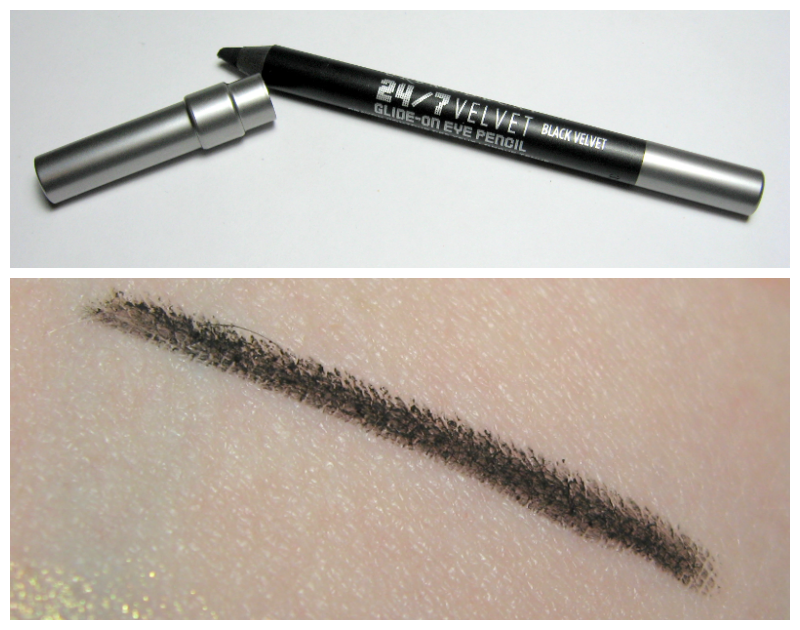 I think eyeliner fans would really like this product! So there you have it. Only two, maybe three products that I'll probably keep using. It is a nice consolation that I only spent $10 for all this, and Ipsy is still the best subscription service I've tried, so I'm not going to quit yet! 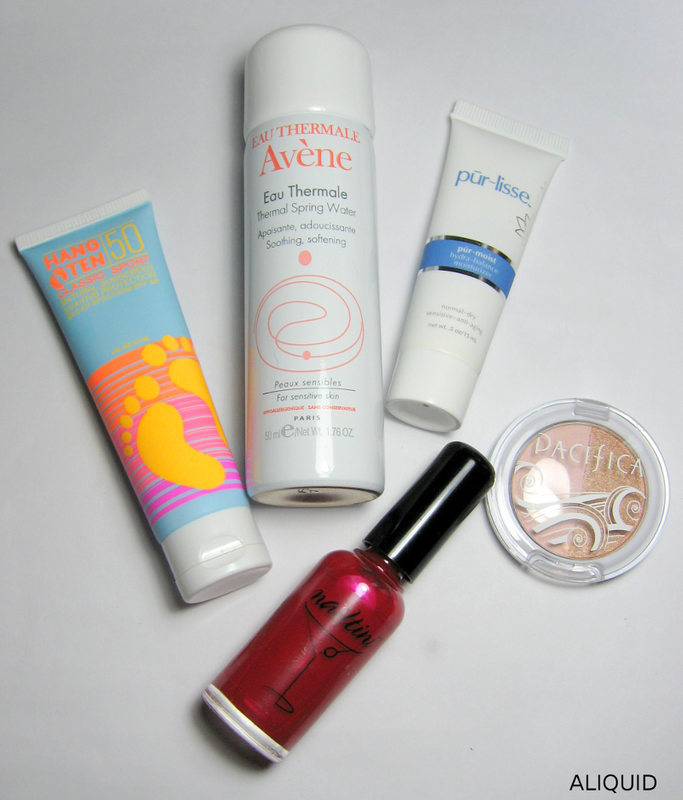 Did you like last month's Ipsy bag? Happy Monday! Today's Neverending Pile Challenge prompt is vampy. This wasn't hard for me, since I'm constantly buying dark polishes (I think I'm a goth at heart). I started with a base of China Glaze Lubu Heels (a beautiful black with red microglitter) and sponged on Revlon Saucy at the tips. 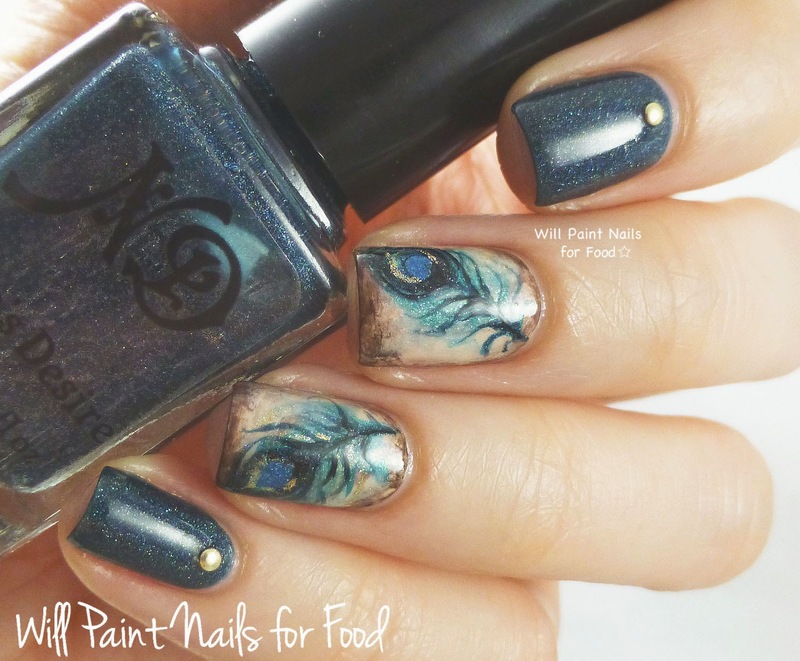 This would make a spooky Halloween mani! 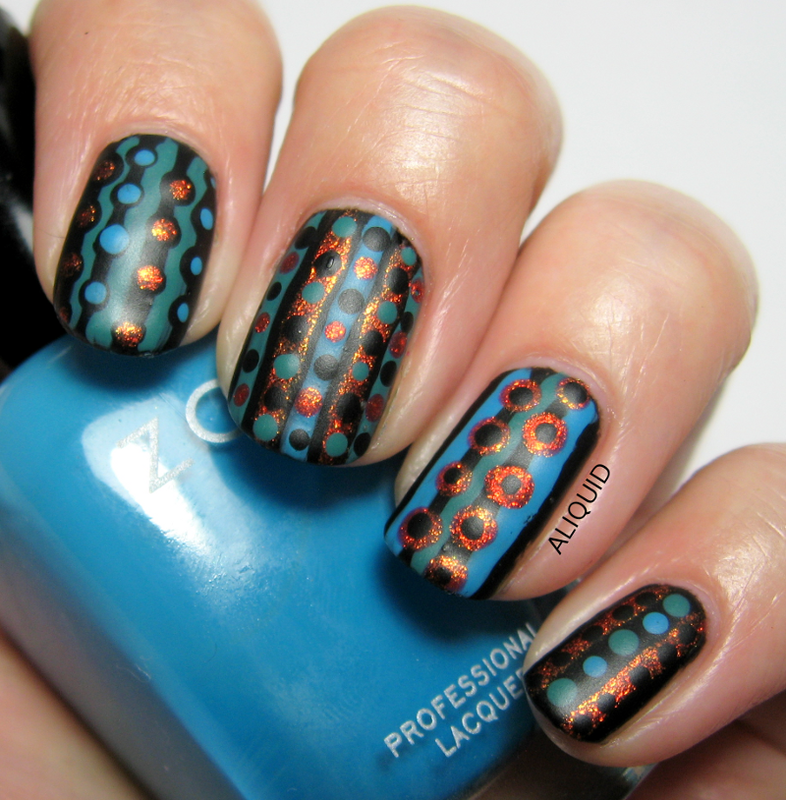 This mani was loosely inspired by this dots-and-stripes mani by My Adventures in Nail Art. My stripes aren't even, and I think I made the middle finger a little too busy, but overall I like the result. It kinda reminds me of a circuit board--very sci-fi! OK, here's my slight "nail fail" first attempt. It started out fine at first, although the lines aren't as clean as I would like, but then I added matte topcoat too soon and it got all bubbly. 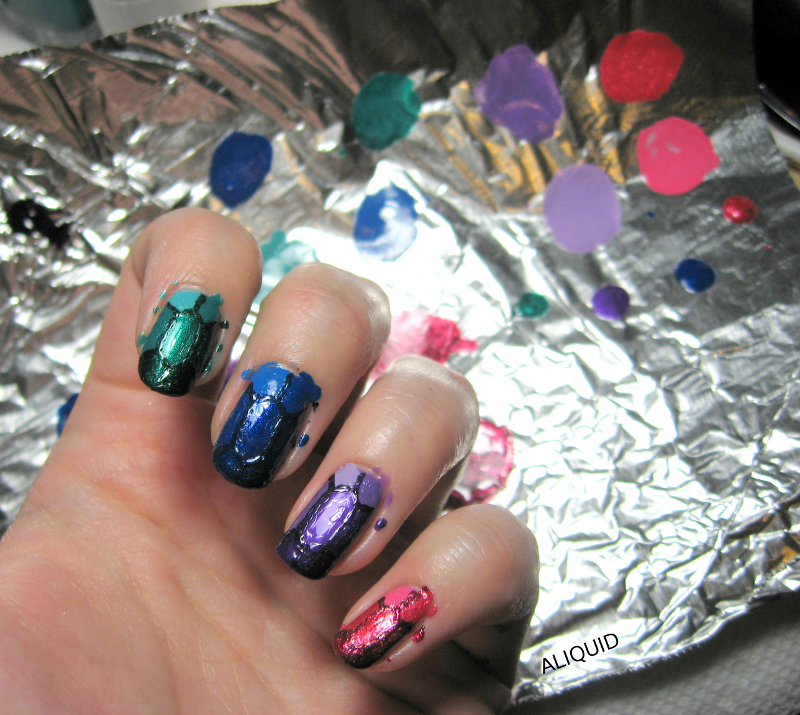 Don't you hate it when the last thing you do to a mani kind of wrecks it? Oh well. 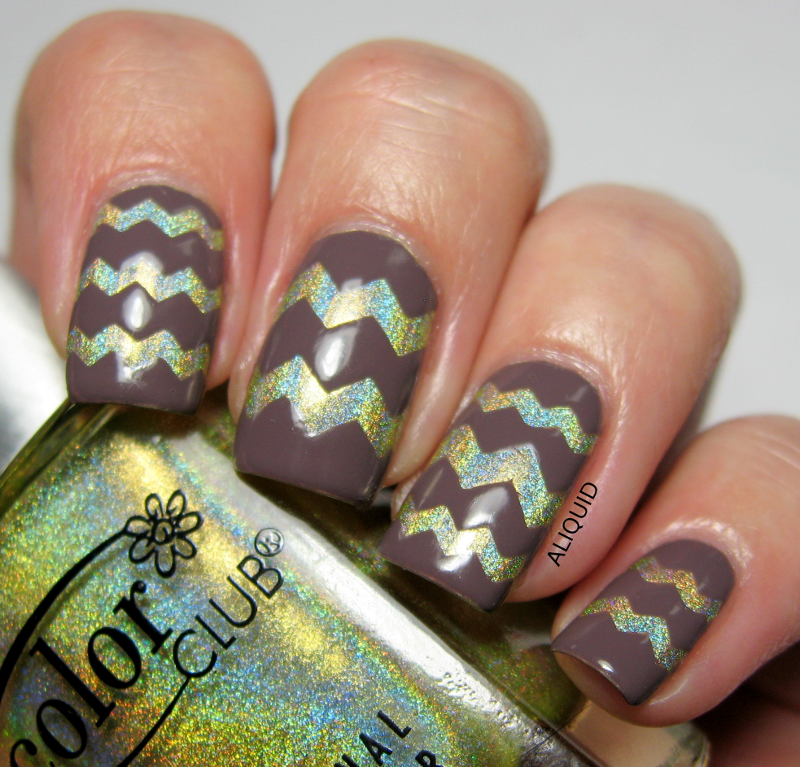 I like the pattern, so I'll probably attempt this mani again sometime. Hey there! Any fun weekend plans? 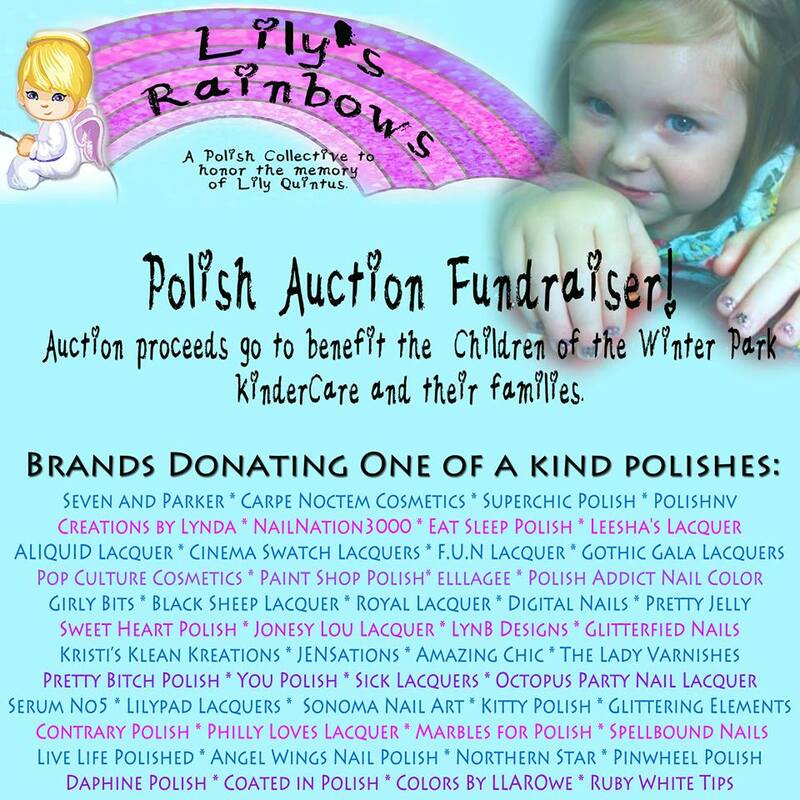 I have lots of nail-polish-related business as usual! 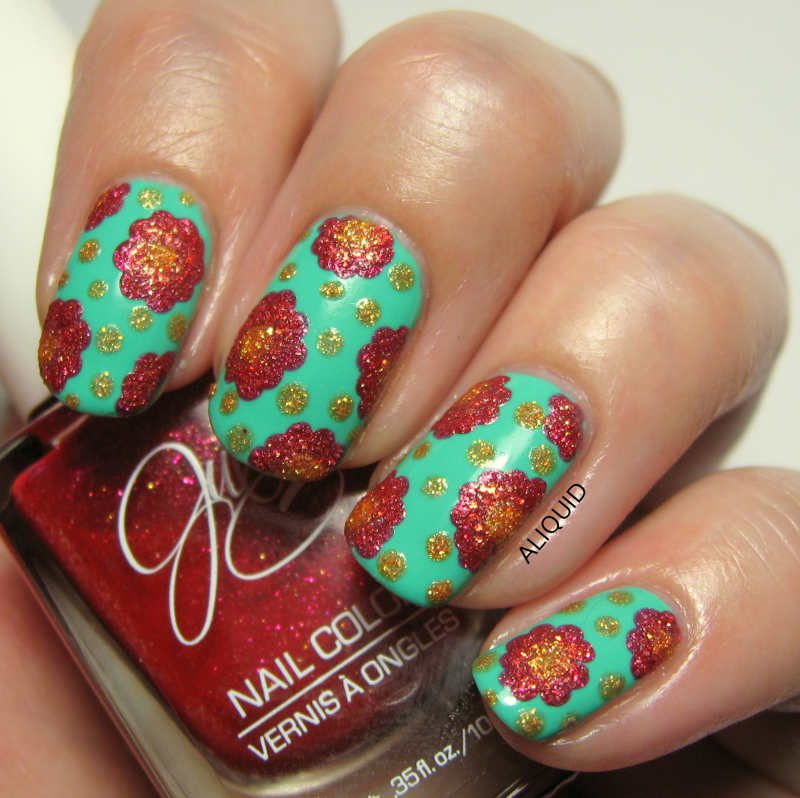 Today I've got my (slightly belated) favorite nail art from April for you! All five are amazing freehand works of art! 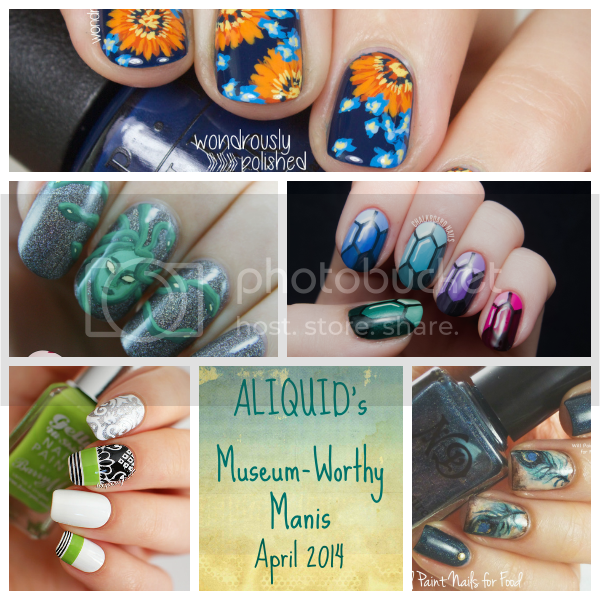 Don't forget to check out my Pinterest for more awesome nail art from around the web, and please visit the artists' posts to read more about their manis! 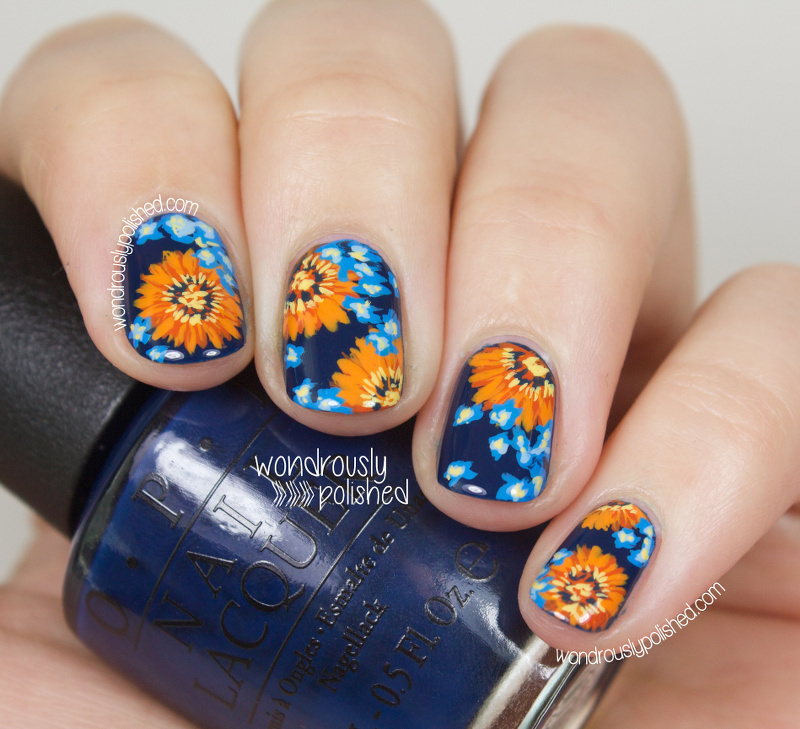 I adore this mani--the orange just pops against the blue background, and I love the semi-abstract style of the flowers. I also think she got amazing mileage from what looks like pretty simple techniques; I think I might even be able to recreate this mani decently! I'll need to give it a try sometime. 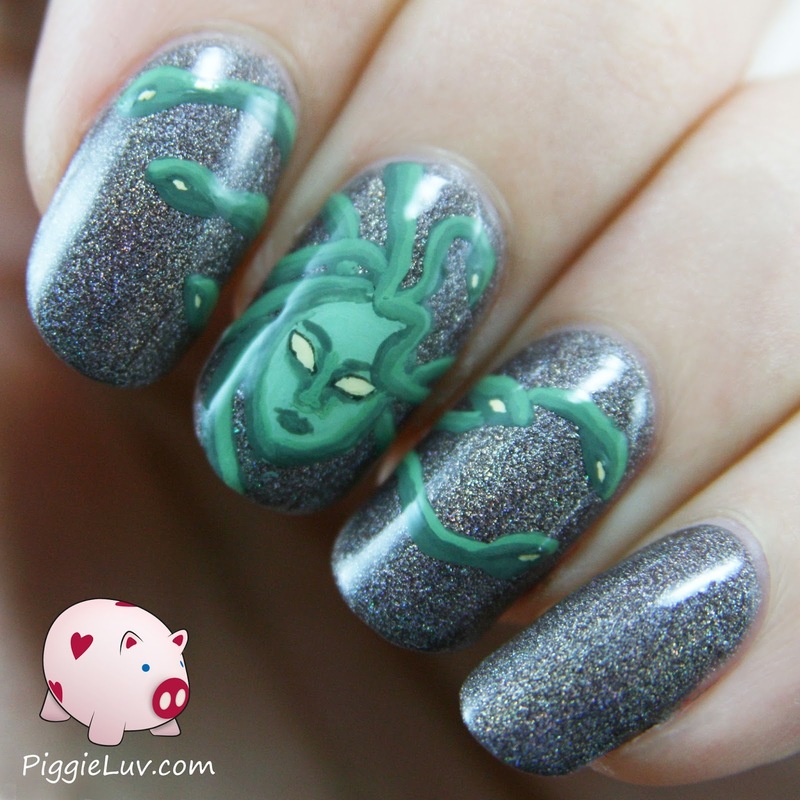 As a classics geek I have to love this mani. It's so creepy! 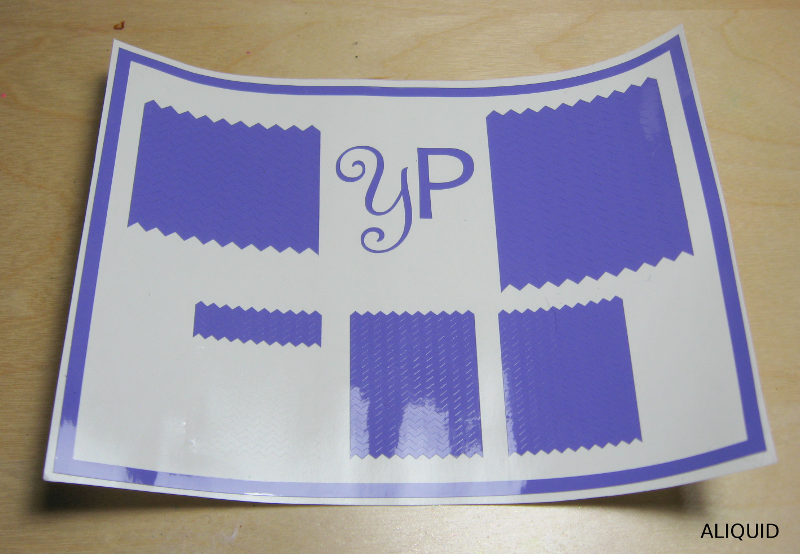 Plus the freehanding is just flawless. I'm always jealous of PiggieLuv's skills! 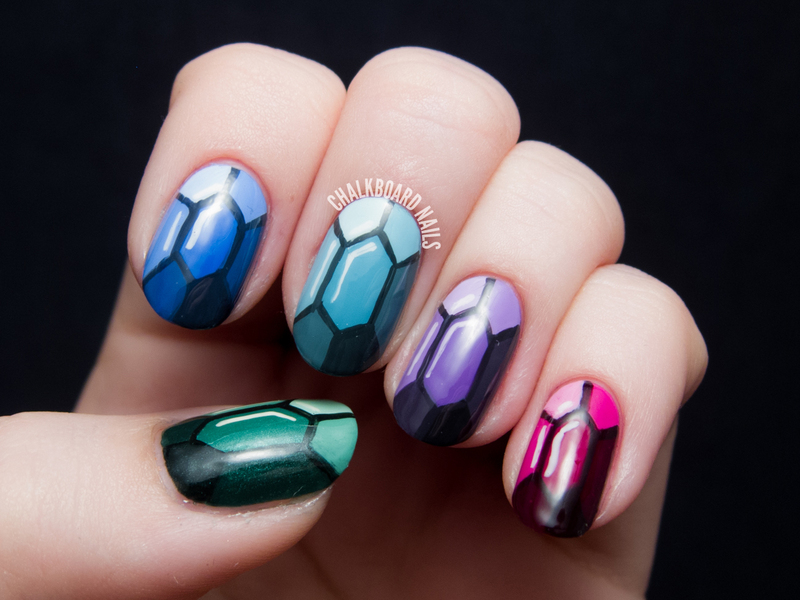 Chalkboard Nails is one of those bloggers who not only does consistently beautiful nail art, but also makes her nail art accessible by providing tutorials for nearly everything. 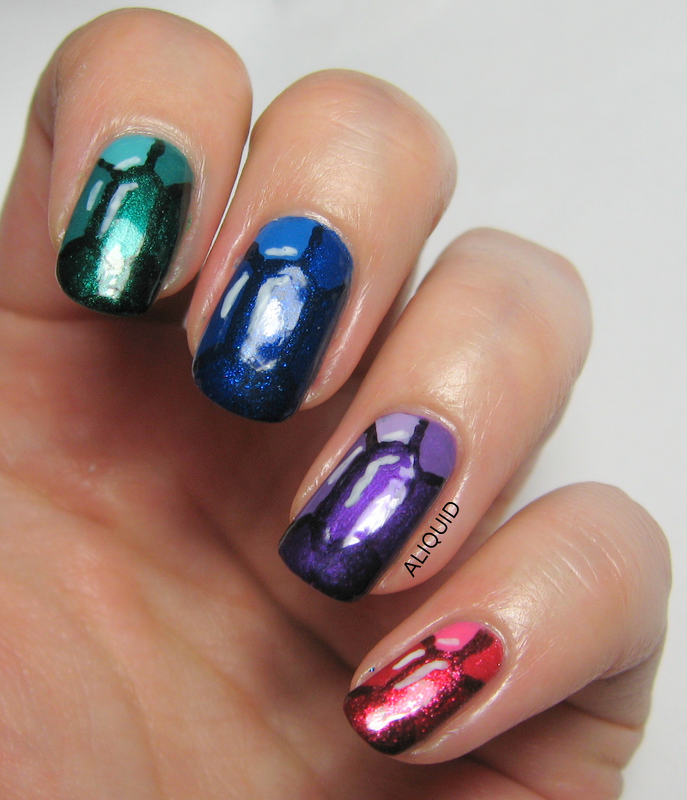 So you can visit her site to reproduce these stunning gemstone nails for yourself! 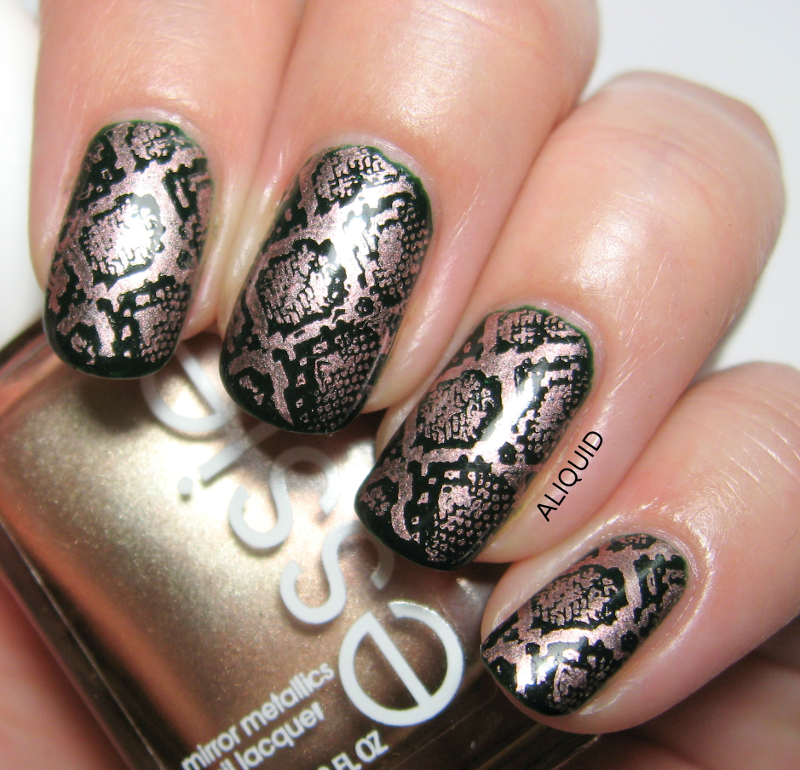 My favorite bit is the little white "gleam" lines that make this mani look so realistic! 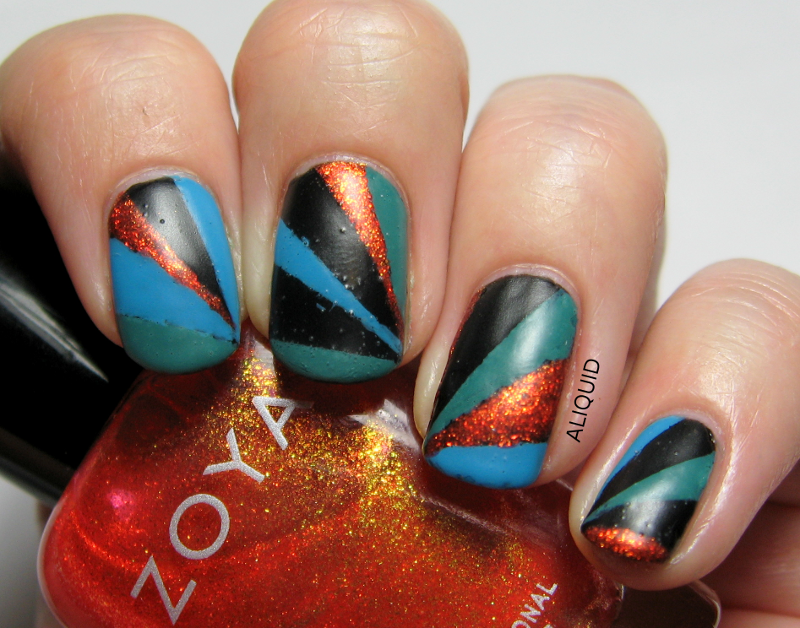 I was shocked to read that this mani was done entirely freehand--not even any striping tape! Now that's talent. I love the contrast of the baroque/damask patterns with the more modern clean stripes. Plus that green really pops against the neutral colors! How beautiful are those feathers?? You must go read Meghan's description of her process for these nails--you can tell she has artistic training. I love how she captured the wispiness of the feathers perfectly! 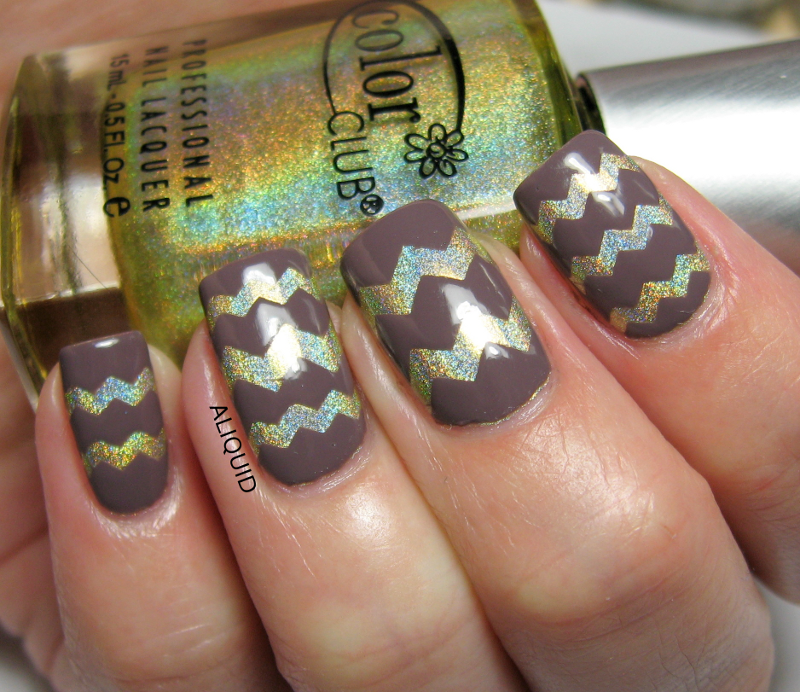 I don't know about you, but looking at amazing nail art always inspires me to try something new! 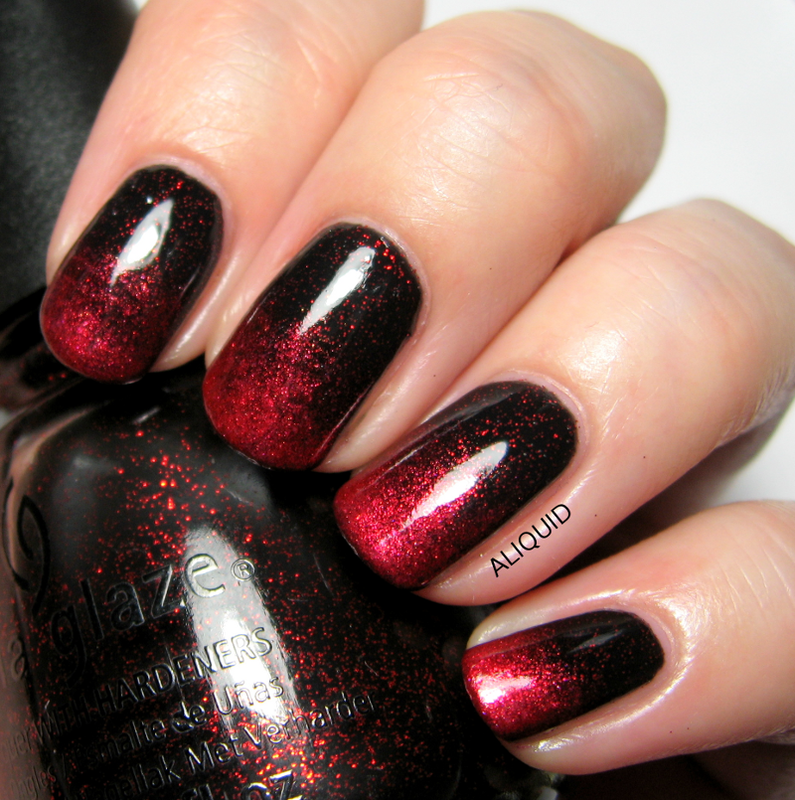 Are you inspired by any of these manis?